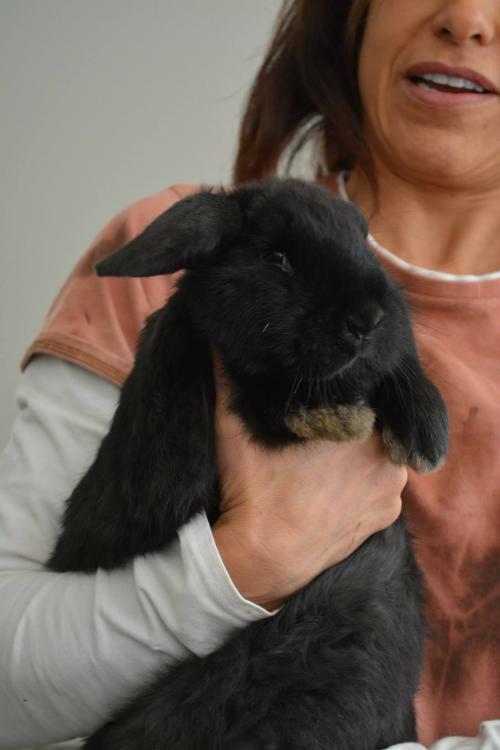 We sadly lost Rudy due to the severity of his injuries. We loved him deeply and he deserved to live a long happy life. This is a graphic, but important story. Please read and share. We are doing all we can to help these babies and are deeply grateful for your support! 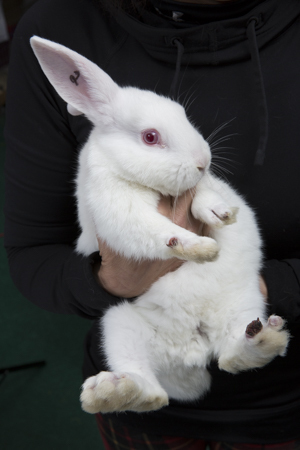 On the evening of December 24, 2014 nineteen baby "meat " rabbits were saved from death at the hands of a meat rabbit breeder in Sacramento. These innocent, trusting 7 week old babies were being sold as "imperfect" snake food or for human food. Housed on filthy wire cages and separated from their mothers they had been attacked by at least one dog and had most of their toes chewed off through the wire cage bottom. 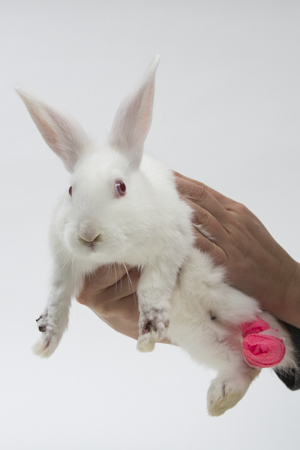 Rudolph, shown below,is the most seriously injured baby and has almost one entire foot missing. He was suffering from shock, malnutrition and pain. 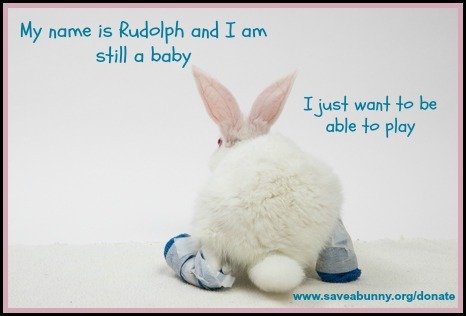 Rudolph is in very guarded condition and it is a day-by-day process of his being able to recover or not. 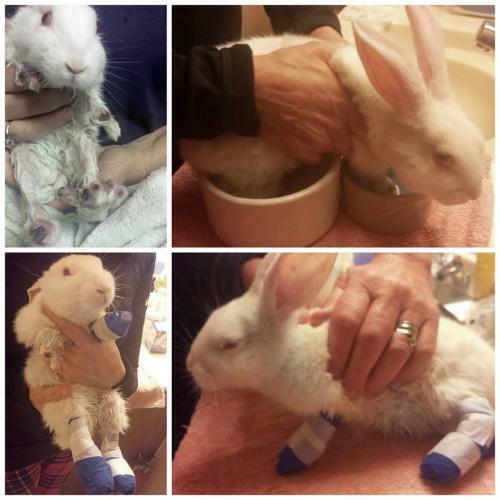 He has a deep infection in two feet and will require extensive reconstructive surgery and possible amputation. All four feet were seriously injured. He is on antibiotics, pain meds and is getting Reiki and alternative healing, which has dramatically improved his quality of life. We spend a lot of extra time giving him kisses, reassurance and the type of "mothering and nurturing' that he so desperately needs. 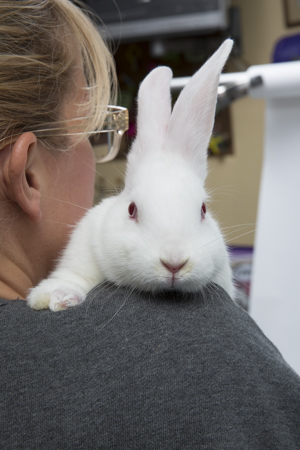 We have seen many times that traumatized and abused rabbits need to "connect" with a caregiver in order for them to want to survive. 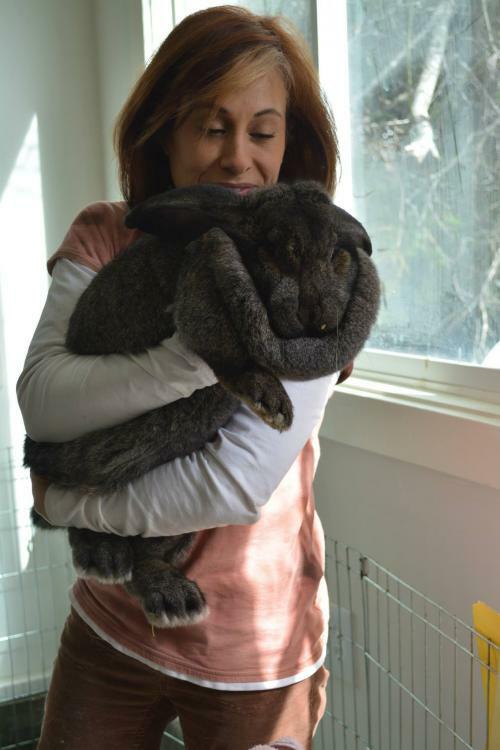 Without trust, love and feeling safe rabbits can and do shut down. 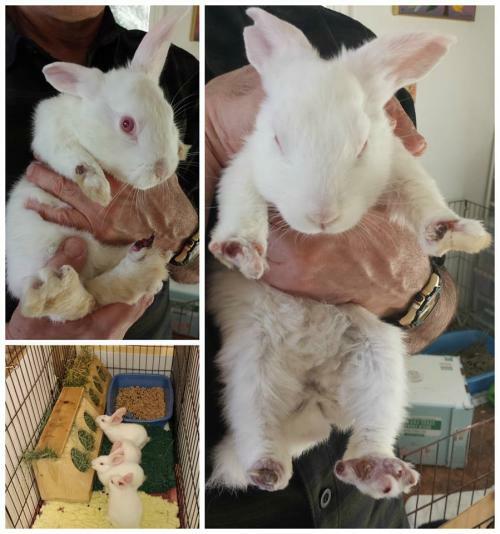 SaveABunny became involved when we responded to a plea for help from Second Chance Bunnies located near the breeder in Sacramento and agreed to help by taking in the six most injured rabbits from the group Rudolph, Holiday, Hermey (Rudolph's buddy),Flurry, Yukon and Clarice. Their pictures are shown later in this post. 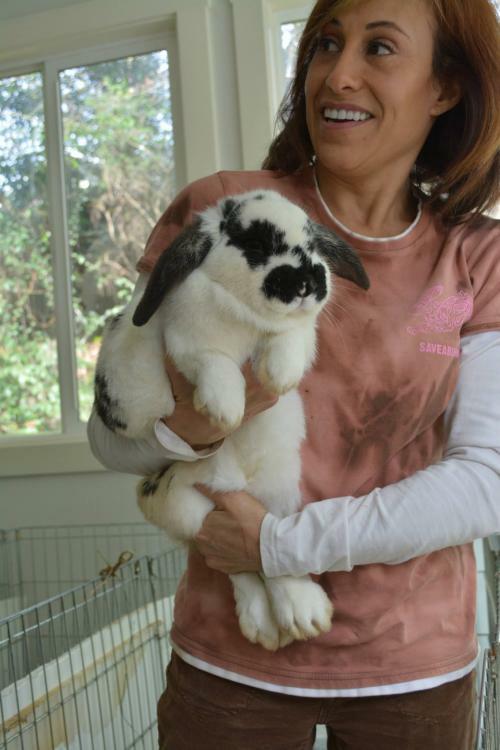 We are working closely with Team Fur in Sacramento, House Rabbit Society (emergency $500 grant received--THANK YOU!) 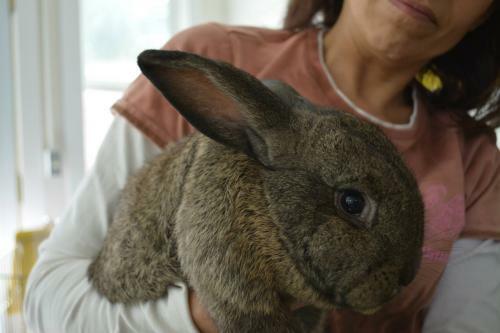 and Second Chance Bunnies to determine if charges can be filed against the breeder. 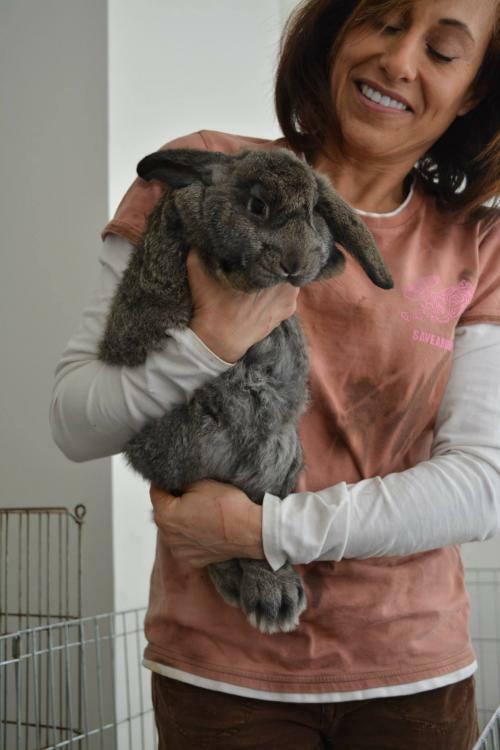 he problem is that it is difficult to get photos or "receipts" when doing undercover work as Janet from Second Chance needed to do to get these bunnies to safety. Hermey (shown in two photos above) is a baby boy and Rudolph's best friend. Three of his feet are very injured as you can see from the photos. 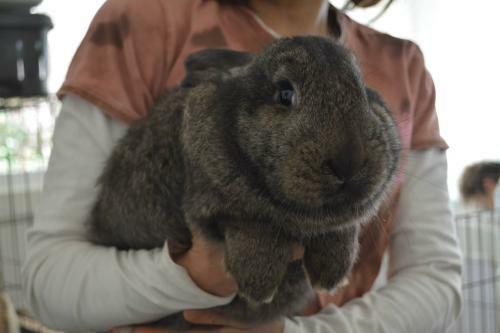 He is at SaveABunny. Holiday (shown below) is a baby girl and is the next most injured baby. She has lost several toes as well as parts of her feet and needs surgery. 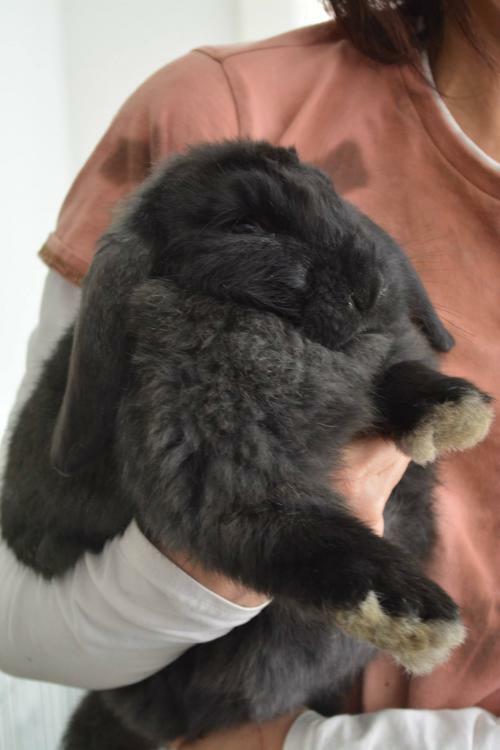 Yukon (shown below) is a baby boy. 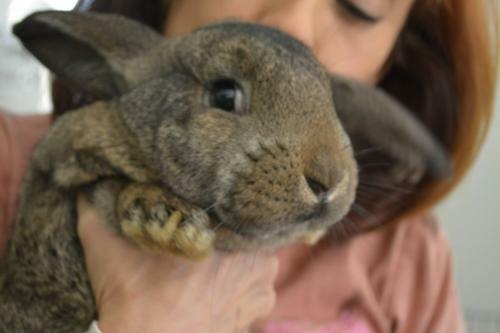 Clarice(shown below) is a baby girl. 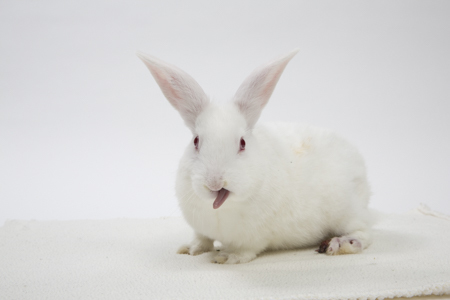 Flurry, aka "Mr. Attitude" shown below is a baby boy. 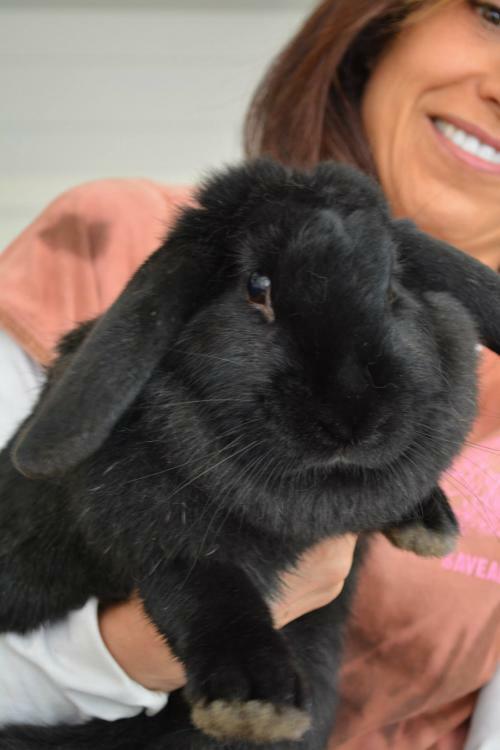 Because there are multiple postings about this rescue, please note that NO bunnies are leaving to go to other rescues outside the immediate SF Bay area until animal control completes an investigation. 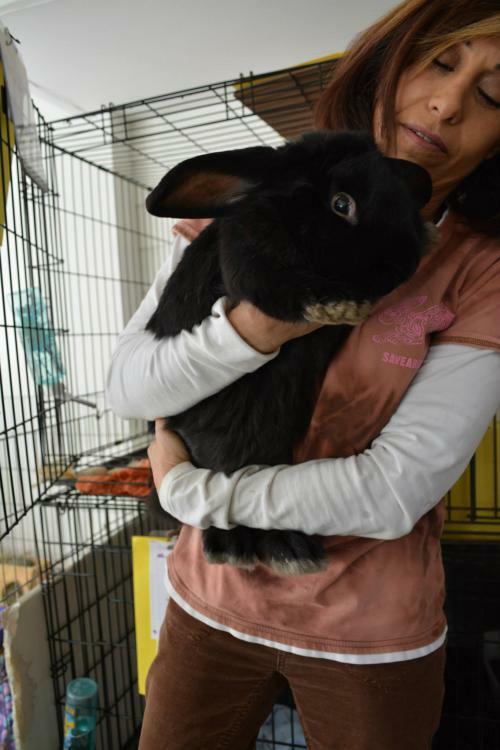 At this time all donations are ONLY going directly to Second Chance Bunnies which still has 13 less injured bunnies to care for and medicate and to SaveABunny, which has the 6 severely injured babies. 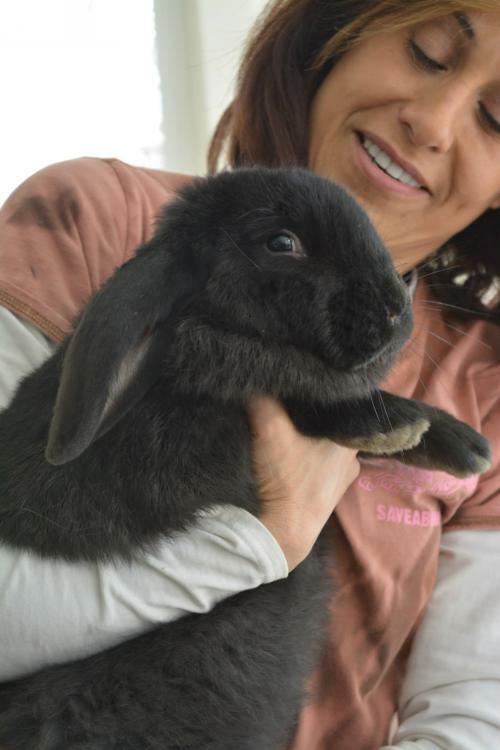 Harvest Home, PetSave, Zooh Corner and Team Fur have offered to take bunnies when they are healthy enough to be transported. 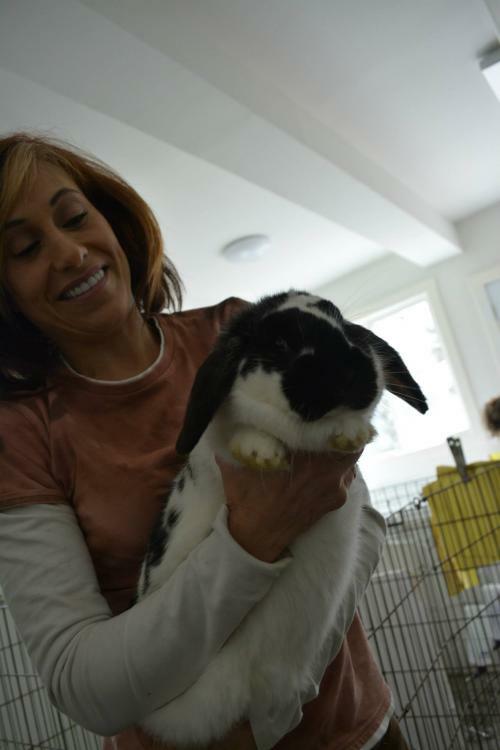 SaveABunny is coordinating rescue and fundraising efforts to assist with the overall rescue and veterinary expenses, which are estimated to be about $10,000. 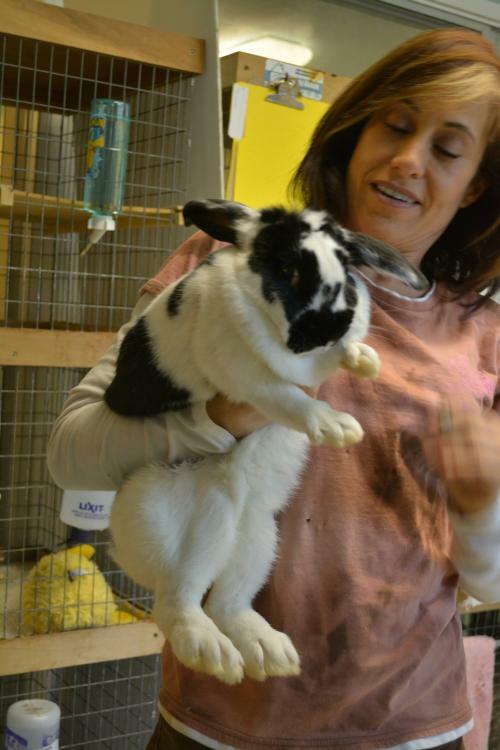 At least 3 of the rabbits at SaveABunny are expected to need surgeries. 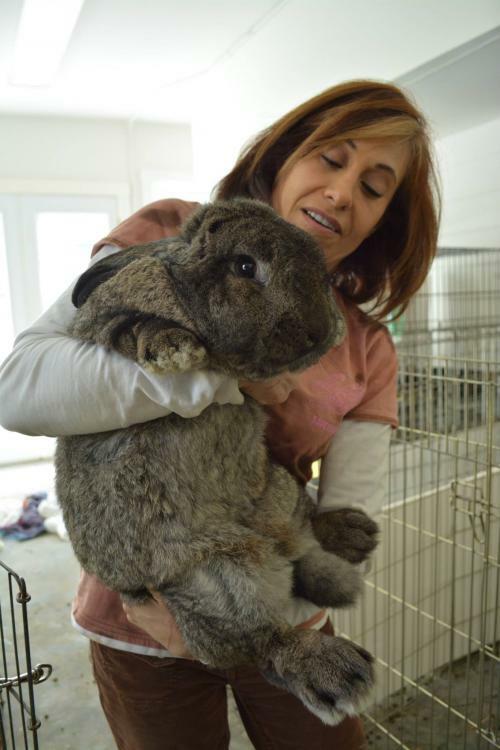 Additionally, to date, $2000 has been sent to Second Chance Bunnies to pay for rescue efforts, veterinary bills, medications and rabbit care supplies. 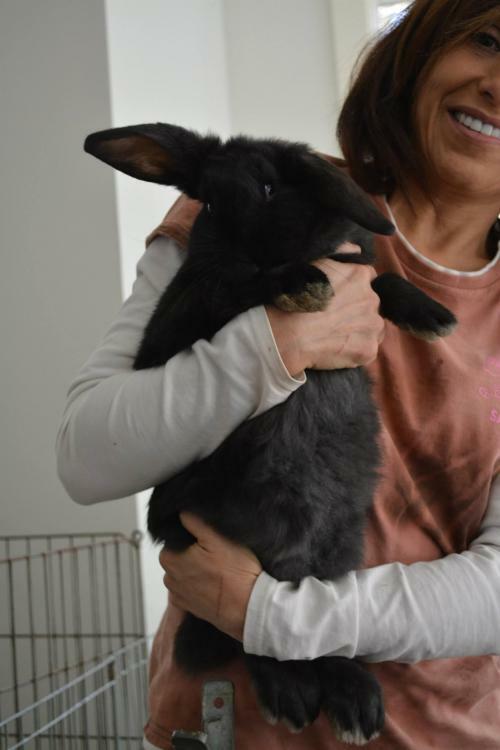 We will use donations to assist with any additional expenses Second Chance Bunnies has related to this rescue and have offered to help reimburse other groups who step in to help. We are incredibly grateful to donors and feel it's important to show that donations are accountable and being used wisely. 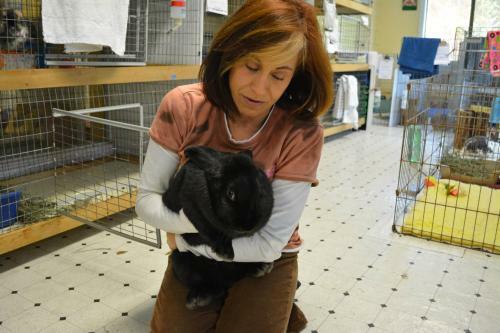 On February 15, 2014, three SaveABunny volunteers and Marcy rescued 29 rabbits from cruelty and slaughter at a Sacramento "family" meat farm. 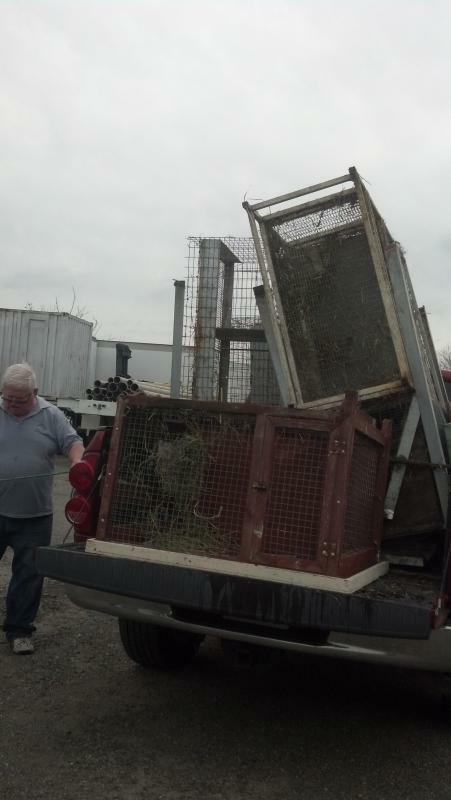 Additionally, we purchased all cages (which went right into the dump) so that this rabbit meat operation would not continue. 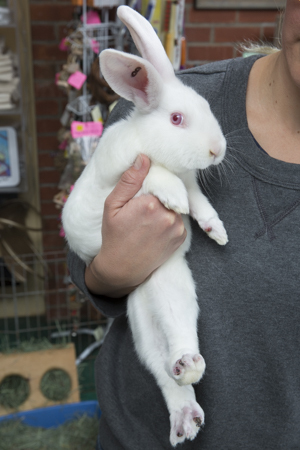 These terrified, but non-aggressive rabbits were crammed into wire cages right next to where their babies, brothers and sisters were being slaughtered. 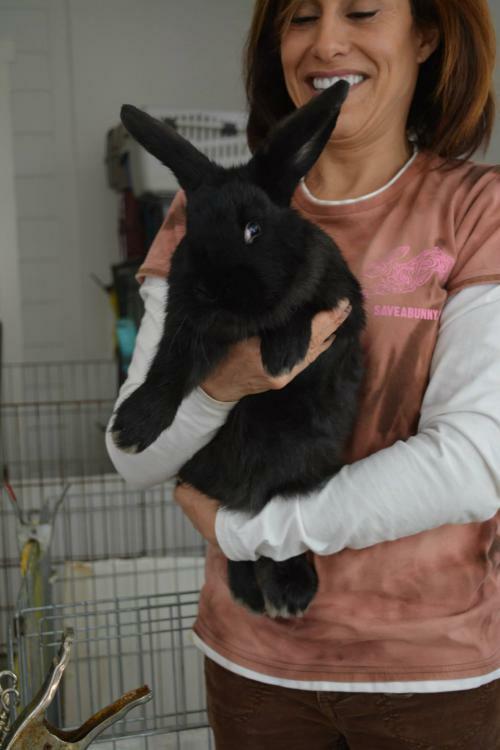 Many were traumatized from being treated so poorly and others emotionally shut down from seeing killing and hearing the screams of rabbits dying. 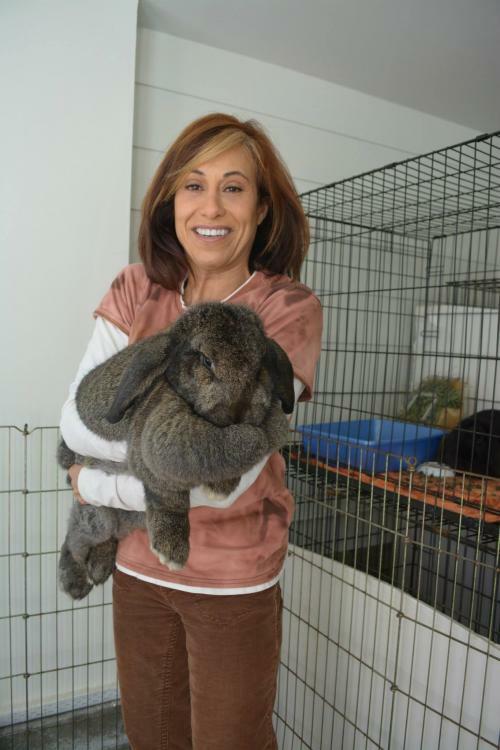 The photo below is the breeder holding one of the rabbits for their craigslist ad. 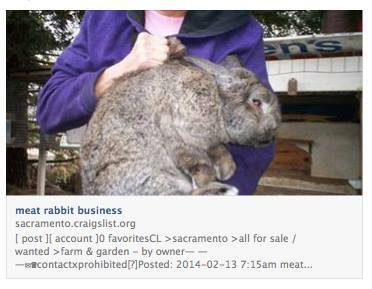 Here is the original craigslist ad that shows the sensitive and loving bunny we now call "Kingsley" being held by the middle of his back by the breeder. And below is Kingsley after a few weeks of love and kindness. 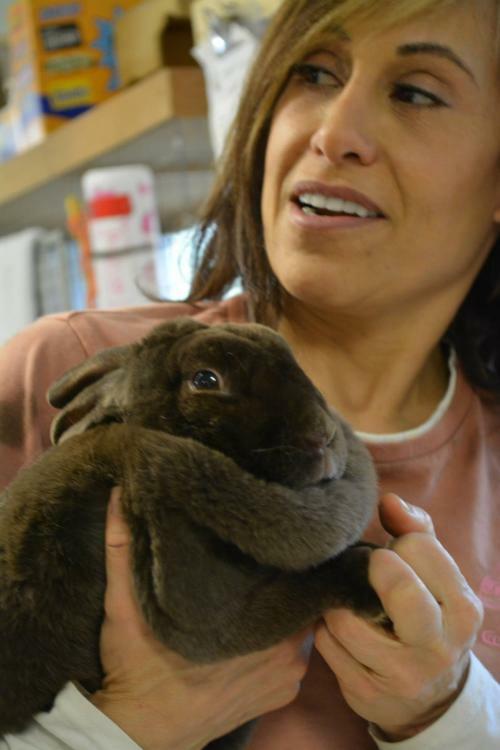 This intensive rescue would not have been possible without the extraordinary dedication from two great rescue groups from Washington state and working together, all 29 rabbits were brought to safety. 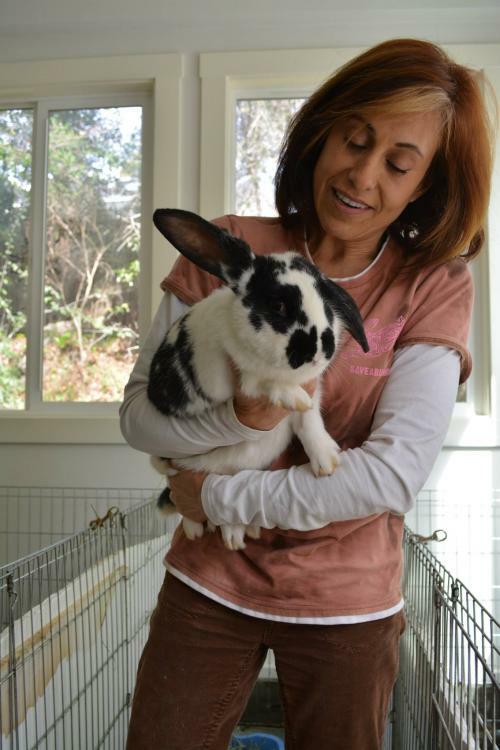 Sue Brennan, at Rabbit Haven in Gig Harbor, Washington and Marcy worked closely together. 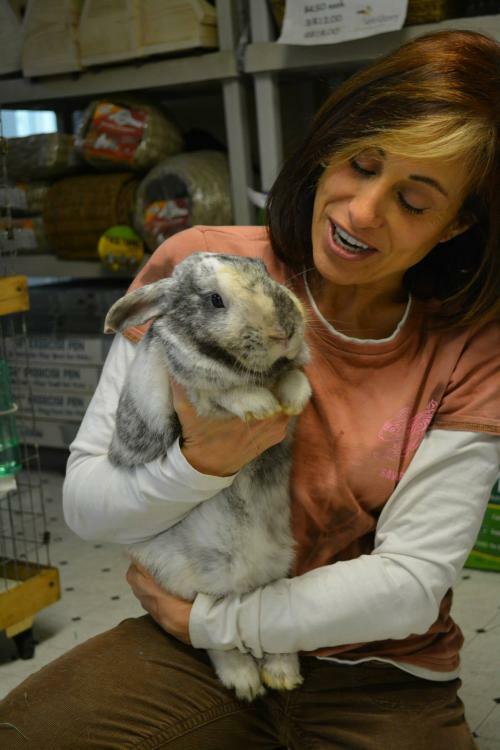 Sue raised the money to rescue the bunnies and buy the cages cages while Marcy volunteered SaveABunny to do the undercover rescue and temporarily shelter all 29 rabbits. 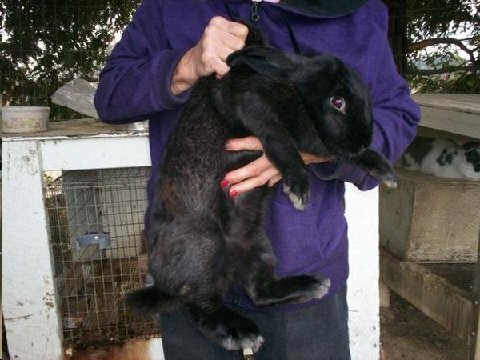 Time was of the essence to save these bunnies since they were being advertised for meat production to the first bidder. 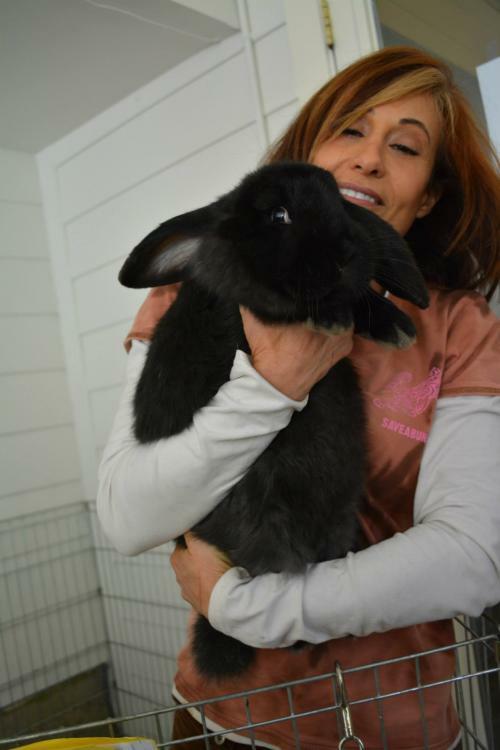 Angie and Tamara from Special Bunny rushed in to help with transport from San Francisco Bay area to Washington state for many of the rabbits. 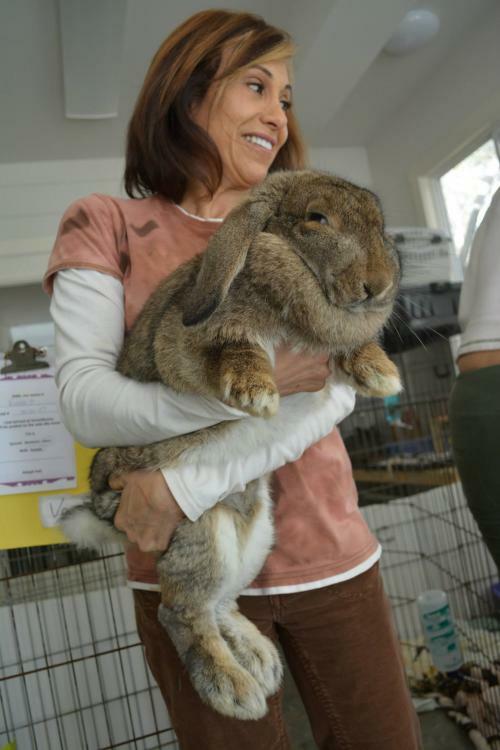 We appreciated helped from Team Fur, Sacramento HRS, and other groups who took in a few rabbits and placed them up for adoption. 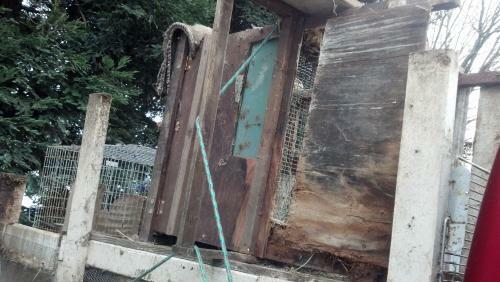 These are photos of the filthy cages after we loaded them up on our truck. 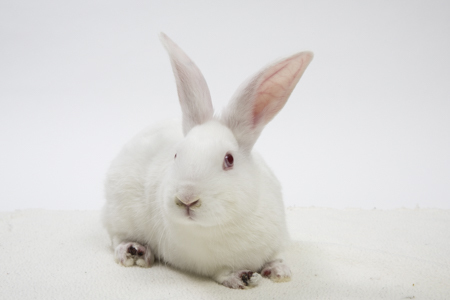 We needed to work quickly and did not take photos of the rabbits in their cages, because we did not tell them the rabbits were going to rescue. They would have killed the rabbits in front of us. 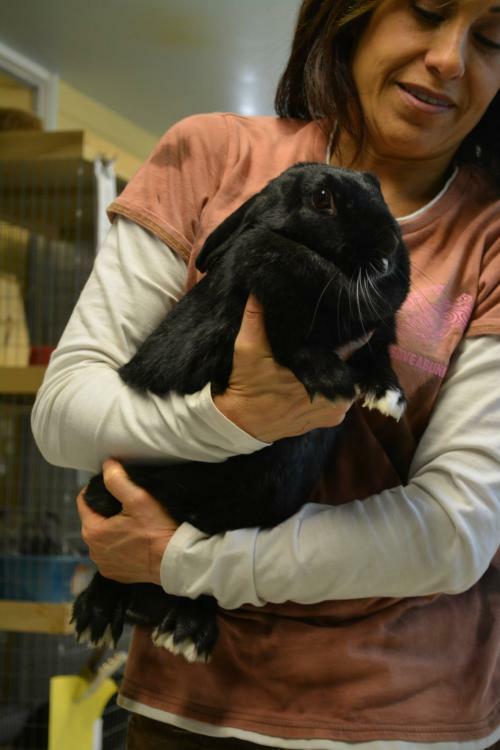 At this point, December 2014, most of the rabbits have found homes or are in sanctuary at Rabbit Haven in Gig Harbor, Washington State or at SaveABunny. 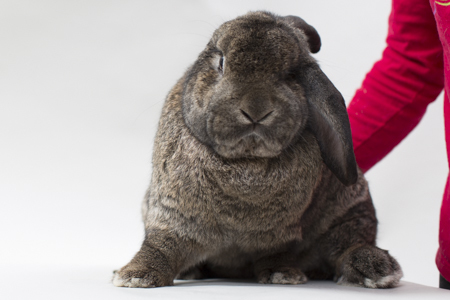 If you would like to meet the bunnies at SaveABunny who are still available for adoption their photos are listed below. 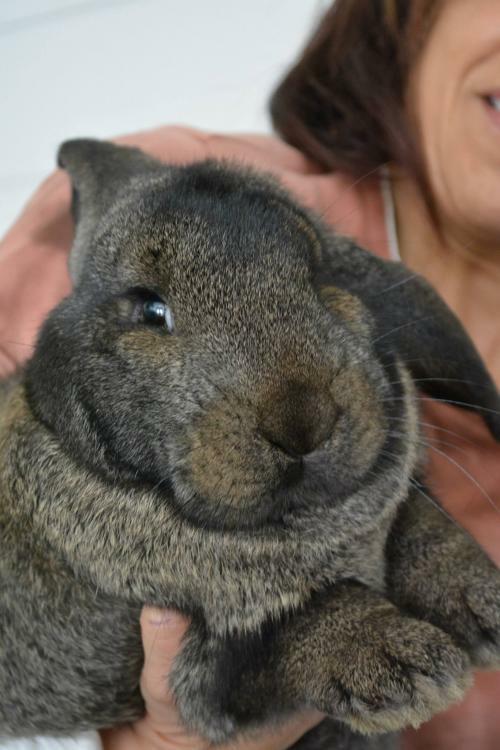 Photos of almost all of the original rescue rabbits are below as well. 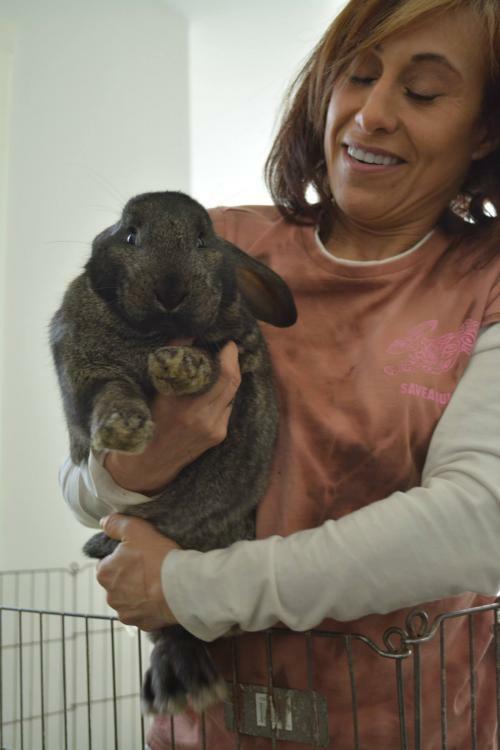 We would like to extend a special thanks to the ASPCA for a $25,000 grant in 2013 that allowed us to build a play area that we were able to convert temporarily into an overflow and emergency triage center for these precious rabbits who deserved to be a treasured family member and not someone's dinner. ABOVE: Mojo. 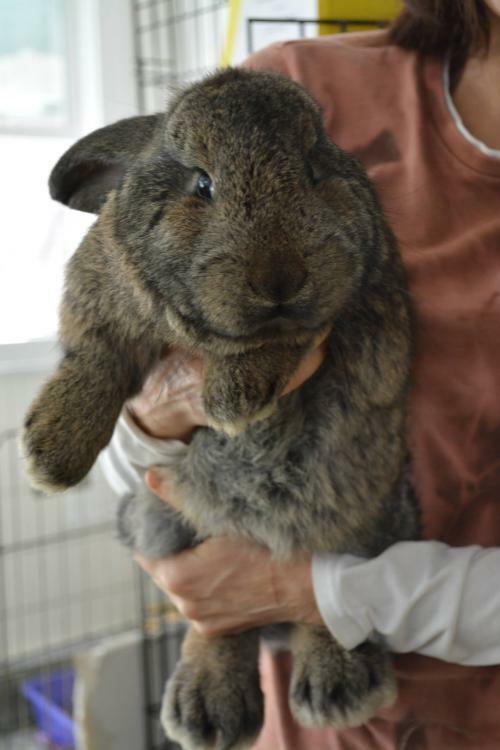 Very sweet and handsome, neutered boy! ABOVE: Kingsley. Needs lots of TLC and socializing. Neutered boy.